Sprinkled with feta cheese and drizzled with garlic-dill butter you can substitute potatoes in place of the sunchokes in this delicious Easter side dish. Jerusalem artichokes are also called sunchokes. They are nutty, flavorful, starch-rich roots that are native to Central America. They have a high-quality phyto-nutrition profile which includes dietary fiber, antioxidants, vitamins and minerals like potassium, iron, and copper. Use organic eggs in this braided crown of Greek Easter bread. As per custom, the eggs are dyed a scarlet red, but you can skip the chemical coloring if you want to make it healthier. Pomegranates have plenty of vitamins, fiber and minerals. Regular intake of this anti-oxidant rich fruit is said to keep cholesterol and blood pressure under control. A healthy protein source with crunchy fiber. You can garish this Easter dish with fresh cilantro sprigs. Borage flowers have medicinal properties that are helpful in reducing fever and cough. The carrots are packed with vitamin A, while the garlic helps fight both bacterial and viral infections. A scrumptious blend of refreshing tastes and textures with sugar snaps, sweet green peas, salty bacon, mint and cream sauce. A rich citrus flavor accompanies this yummy roasted chickened served with spring onion spiked freekeh. Freekeh is toasted and cracked young green wheat. A single serving has more protein and twice as much fiber as that of quinoa. With two kinds of cheese, sour cream, mayonnaise, mushrooms and onion, this rich and velvety Asparagus Casserole is topped with crunchy fried onion. Portobello mushrooms, spinach and hazelnuts make this a very healthy and delicious cauliflower roast. Baby portobello mushrooms are a nutritional powerhouse with many vitamins and minerals including selenium. A novel and refreshing presentation of minty fresh peas and ricotta served on toasted baguette slices. The perfect Easter side dish these crunchy puff pastry squares are topped with an incredible cheesy potato mixture. Roasted almonds, lemon and garlic impart such amazing flavor to this crunchy asparagus and carrot salad. A healthy green side dish of courgettes, peas, broad beans and parsley dressed with olive oil and lemon. Loaded with fiber, vitamins, iron and potassium, these roasted red potatoes are sprinkled with thyme and parsley. Creamy and lemony chicken broth that is bursting with healthy nutrients. Rich with omega 3, this delicious salmon recipe includes potatoes and green vegetables. 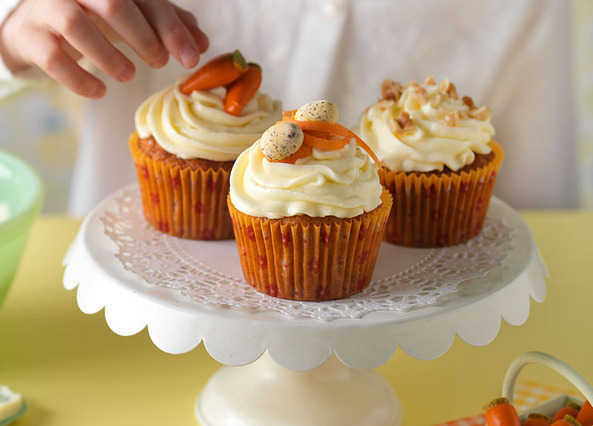 Protein rich cheese and healthy butter top these mini cakes filled with the goodness of carrots and walnuts. Roasted lamb flavored with herby butter and served with mint sauce and celeriac mash. Serve this cheesy souffle with a tomato and fennel salad. Bake and serve immediately before its deflates. Goat milk cheese is easier to digest and lower in cholesterol than cow’s milk. It is a good source of calcium, protein, vitamin A, vitamin K, and phosphorus. An Easter treat with Almonds, pistas, greek style yogurt and free range eggs.